This project was funded by MLA as part of the "Their Past Your Future" programme. 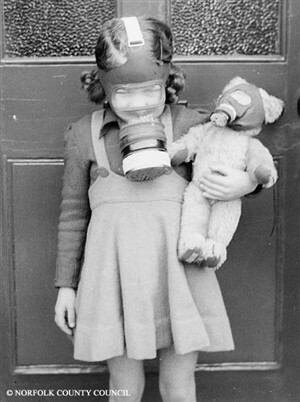 The picture above shows Judy Swain in her gas mask. It is reproduced courtesy of Norfolk Libraries and Information Service - Picture Norfolk Archive. This page was added by Colin Stott on 09/09/2010. Does anyone know when Coastal Gun site which was on the Cliffs at Gorleston was knocked down?